'78 Spectra with a belly tank. Somewhere on the way to Laughlin, my screw on gas cap decided to part ways with the boat and left just the chain hanging. Anyone have one lying around that they'd like to sell or know a source? Probably 2" inner diameter and 3" outer diameter screw on cap: smooth top, ridges on the sides, heavy as hell. Can't find a source anywhere and I'd like to keep it original. So at the avi trip I kept hearing a light knocking \ clinking sound that would come and go not specific to RPM. No metal in the oil, so I changed fluids, greased everything I could get to and took it to Parker the next month. Ran great for three days and then bam loud clinking like a marble bouncing around near the thrust bearing, back of the engine. What's the best way to separate an engine \ jet with three point mount to isolate whether it's pump, engine, or drive line? I couldn't find foreign object looking through the intake nor handhole of the pump; was hoping it was just a rock or something easy. My gauges have been failing, so I've decided to replace the old ones with new gauges and senders. I'll be replacing the ammeter with a voltmeter. 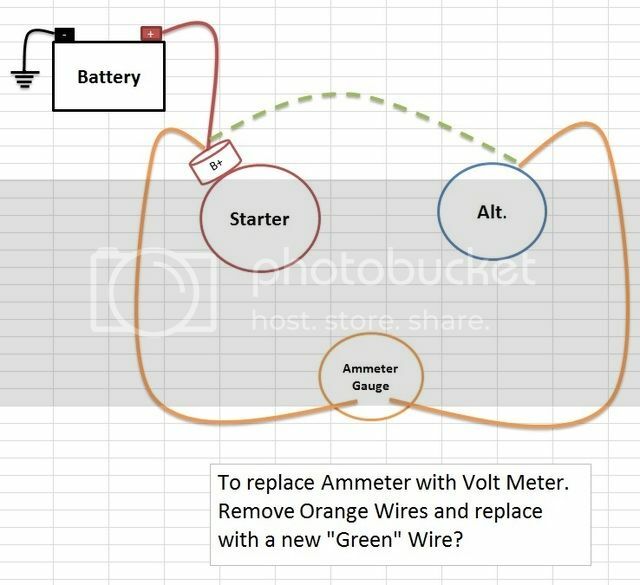 To safely remove the ammeter, do I simply disconnect / remove the orange wires that run from starter to the ammeter, then alternator, and lastly connect a new 6 ga. directly from the starter to the alternator using the same connection points? I drew a quick diagram which may show it better. I plan to disconnect the orange wires and put the new "green" wire in their place. Anyone know a part number that I can give an auto parts store to get a 1978 454 oil pressure sender with the screw on post for the wire? I can only seen to find the one with a spade connector and heard the spade ones are for dummy lights only. My current sender has no part number on it. Saw this posted up. Heard about them when we were in the cove and even saw the Rogers, but it didn't connect that this was the boat that they put the truck engine in. Saw our group and my Spectra a few times when they cruised the cove. The boat has been doing this since I bought it in May. Runs great on the trailer. Starts fine at the launch ramp. Launch the boat, starts fine, and then stalls and doesn't want to restart. If after time it restarts then it's normally fine. If it doesn't, then I get to go home. Today at the TPM it did this exact thing. Except now it won't run on the trailer either. Got it home and started playing with it. I figure the floats are off and causing issues when the boat is in the water. I checked the floats and both measurements were out of spec, so I set them per the manual. I notice my fuel pressure is building up to 10-12 on the gauge and I can see any fuel getting into the carb. I undid the fuel line to the carb and it shot fuel all over. Also replaced the water separator and it has a new fuel filter. I know there's a ton of fuel trying to get in. If I pour fuel down the throat the boat will run on that, but that's it. The carb is a 750 street carb, mechanical secondaries and electric choke. Floats set per spec. All four jets in the body are clear. Needles move fine. Fuel bowls were clean with no junk in them. I figure there's a passage clogged somewhere. Any ideas on what to look for? Unfortunately one of the little torx head screws for the needle cover snapped, so I have to get an easy out tomorrow. I grew up on the river and have always been in a 21' higher freeboard boat. We normally take the in-laws 21' bow rider to Parker, but I'd like to take the Ranger out this year. Other than being stupid rough on busy weekends, any issues running low freeboard? Upper sandbar I plan on anchoring bow out; have a box anchor. Lower sandbar I'll have no problem with just a sand spike. Will probably only float engine off near the dams and avoid floating the main stretch. My biggest concern is tying up to the docks? For example, the gas docks at Riverland or Buckskin? The bigger boats get bounced around pretty good and I'm not sure how mine will do. We spend a lot of time cruising and floating, so I don't expect the two 10 gallon tanks to last that long and I'd rather not pull the boat out to refill. Also, is safe to tie up to the inside portion of Roadrunner's dock? I haven't seen anyone anchor bow out downriver there and I'm not so sure about beaching it. Same thing with Pirates; the inner docks should be fine, but I'm not sure the boat will survive the main dock, and the beach takes some good rollers, so I'm not sure about beaching with the bow up on the sand. Here are some images of how the boat sits beached at Elsinore and at the newer city dock, yes it's still strapped at the bow, and barely floating, but the only shot near a dock that I have. And one just cause I like it. Heading out in the morning for the tube float! Anyone else going? We're leaving our boat and the in laws are going to be our sober floaters with their boat. Had a lot of fun last year and looking forward to more good times. So after reading the gate valve, ball valve, regulator, thermostat threads, I haven't been able to figure out quite what I have. This is on a new boat, so it wasn't plumbed by me. On the waterline in from the pump I have 1/2" hose bibb with a quarter turn on off. My temps are running 120* to 140* and I'd like them to be a little warmer to burn off moisture. However, I'm worried that this 1/4 turn won't allow me to safely control the water flow. I run it full open because I'm worried that if I partially close it, a bounce or hit off a wake will fully close it. Plastic scared me I guess. Should I swap this out for a gate? At the rear of the block I have a ball valve near one of the freeze plugs. Is this to drain the engine? How often, if ever, should I open this valve? Again it just dumps into the bilge as well. Lastly, this exhaust flange and bolt look burnt to hell, but there's no tick at all from the engine. There appears to be no leak. Should I be worried, or chalk it up to bolts not being torqued when the engine was built and first ran? Made my first post today after lurking for a while and thought I'd say hi. I grew up on the waters of Castaic and Havasu in my dad's 77 Spectra 20. Our group had everything from flattys to cabin cruisers and everything in between. My best memories as a kid are skipping across the lake in a dry pipe flat bottom, and cruising/skiing behind the mini day making runs to the dam. Currently I have use of 21' open bow Chapparal i/o that we take to Parker, Newport, Catalina ect. The boat is great and a perfect family boat. However, I have a major itch to get my own jet and it will be nice to have two boats for our family river trips when all generations are there and we have 10 or so people. The kids are big enough that maxing the capacity on the Chap isnt very comfortable with a dog or two thrown in. 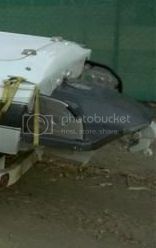 So onto my question: I'm thinking about making a long drive to look at a 19' Spectra in great shape. However, a 19' Kona rigged basically the same popped up much closer to me. I don't know anything about Kona boats and bit about Spectras. Given the same condition of the boats is there any reason to choose one over the other? What's the plate over the jet?